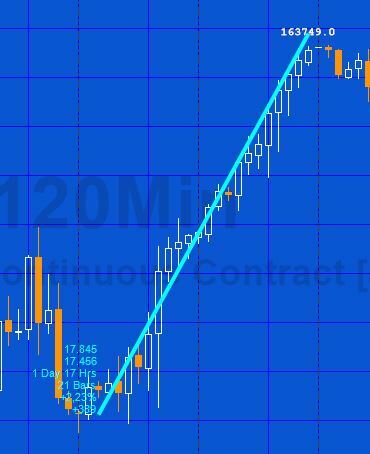 Tutorial 111 demonstrates how to create a TradeStation EasyLanguage showme study designed to calculate the cumulative volume for the bars encompassed by the trend lines (trendline volume) for trend lines drawn using the TradeStation drawing tool. The idea for the tutorial came from a Gold Pass member. It includes a demonstration of how to analyze trend lines that have been manually applied to a TradeStation chart by the chart drawing tool. It also shows how to create a Textlabel that is associated with and is updated and moves with the Trendline, when the trendline is relocated and/or resized. 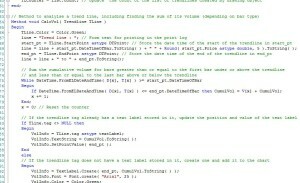 There are several challenges in creating such a program including issues relating to event methods associated with trend line objects and charting host objects. If you are unfamiliar with these terms, I explain more in the video below. There are actually two different approaches demonstrated in this tutorial. I have named them program 1 and program 2. Both programs, essentially, do the same thing. They look for manually drawn trendlines, calculate the volume of the bars encompassed by the trendline and display this value as a text label. If the trendline is moved or resized the text information is updated and the label moved. All the lines that are on the chart when the program is first applied (or when refreshed) are analysed. In program 1 the program uses the charting host to indicate when a chart element has been clicked. When a click is detected, ALL the trendlines are recalculated and the information is updated. This means that when a specific trendline is clicked, ALL the trendlines are updated. The trendlines are updated even when the element clicked was not changed or the element clicked was not even a trendline. This methodology works, but is potentially wasteful of resources, especially if you had a large number of trendlines drawn on the chart. In program 2 I use a slightly more sophisticated approach. 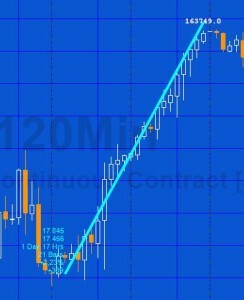 When a trendline is clicked (mouse down), that specific trendline is updated. When the chartinghost event indicates a mouse up event has occurred the most recently clicked trendline is updated. While this approach is not perfect. It does reduces the amount of processing that needs to be done. Both programs demonstrate some useful techniques and programming concepts. 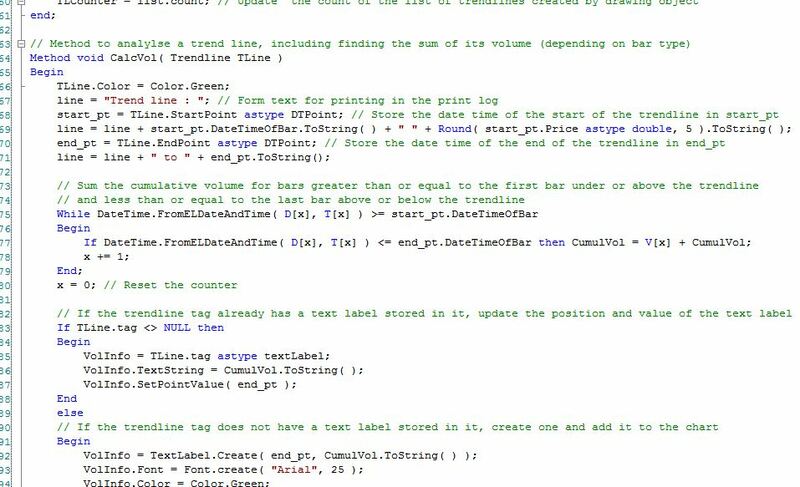 Neither of the programs created in this tutorial have inputs although you may like to convert some of the things that have been hard coded in the program to inputs, for example the color of the lines and text, or the horizontal position of the text. Tutorial 111 (two UNPROTECTED show me studies) is available for IMMEDIATE download for $19.95 by clicking the ‘add to cart’ button. Note that both program names begin with an underscore, so they should be towards the start of the list if you sort alphabetically. Tutorial 111 was developed for TradeStation 9.5 and will not work with MultiCharts. If you notice any errors or have other comments about the programs, please email. The download programs have been updated with these changes. Please note that any screen shots on this site are examples and are not meant to imply that any of these programs will generate profitable trades.